After we built and painted our bench, it was time to decide how to outfit it. We had the original cushions from the dinette, but the fabric was a dingy and outdated… it definitely had to go. 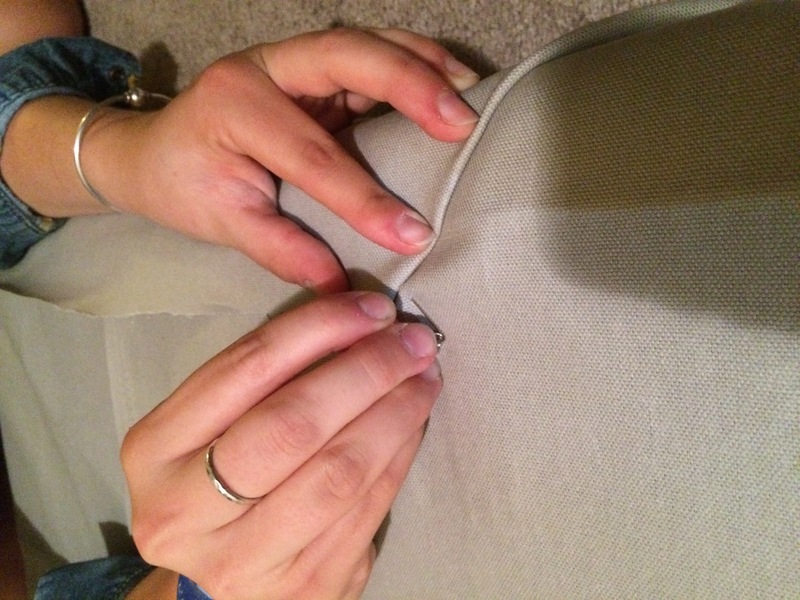 Neither of us have much experience with sewing, nor do we own a sewing machine, but we didn’t want to pay to have the old foam reupholstered professionally. 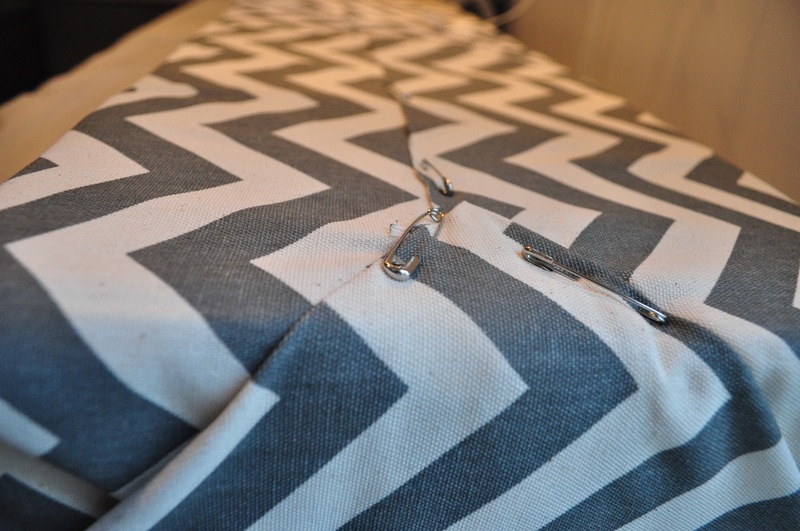 So, our search began for an easy, inexpensive way to create custom cushions. Below, is a picture of the final result, and a step-by-step tutorial on how you can make them, too! First, we opened up the old cushions, and took the foam out. We had to cut the cushions to fit our new bench. A serrated bread knife did the job surprisingly well! Then, we laid out the fabric, and cut it to size. Make sure to have a little extra fabric on all 4 sides. Now wrap the piece of foam just like you are wrapping a present. Make sure to pull it tight! Then, using the safety pins, pin the fabric to itself. Pro tip: go through the fabric twice, lIke shown. Doing it this way keeps everything tighter. A view of the finished cushions on the bench! And here is our bench folded out into “Guest Mode”! Love it. You two are very clever. 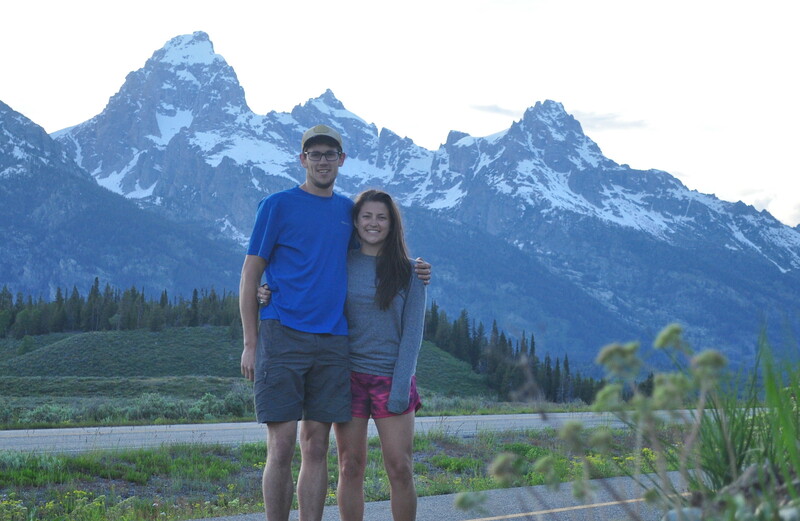 We hope all is going well for you as you settle in to this new adventure. We have just bought our 30′ trailer and are just painting some cabinets now. I want to rip out all the awful bench seating around the dinette area and recreate it in a different, more effective arrangement. My husband is afraid because there is electrical and pipes running underneath the benches. But the pipes and electrical don’t have to be touched as they are affixed to the floor and not the furniture itself. Can’t I just unscrew the benches and cover up the electrical with my new arrangement? Thanks for your inspiration and expert advice! That’s awesome, we would love to see some pictures! Tell your husband there is nothing to be afraid of:) If there isn’t any connection between the electrical/plumbing equipment, and the bench, you should be all set to demo. Our old benches had an electrical outlet in them, but all we did was unscrew the outlet, and then cut the same size hole in our new bench for the outlet to fit into. Just be mindful not to screw the new arrangement into the wires/pipes. Thank you, Dana! The support and encouragement from someone who has successfully completed this kind of project is surely a HUGE help. Our dinette is all ripped out now – feels great! Now I just need to recreate it… I have a good idea of what I will do and I have measured out the small areas where the new cabinets/benches must fit around the wheel well. However, there is a giant “hole” in the middle of the floor where the (I’m guessing) grey water pump is. Any suggestions on how to build around that? I wonder if we should put an ottoman or something over it. It’s in the worst location ever, but its only a small pump – about 6×8″ – set into the floor, so it comes up about 4″ from the height of the floor.